Some things are just timeless. Like red brick is to buildings, steel is to bicycles. You may have noticed that finely constructed steel frames, crafted and welded by the best builders continue to be highly sought after for their unblemished combination of form and function. 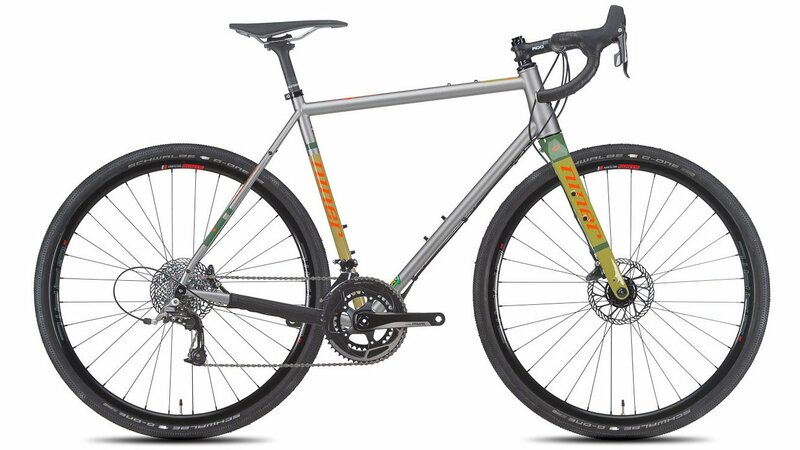 So it only made sense for Niner to re-skeleton their aluminum RLT 9 with supple, trustworthy Reynolds 853 Steel in order to breed the perfect adventuring rig. The RLT 9 Steel is a no brainer for mounting up your panniers and a sweet rack, rounding up the gang and pedaling out for a weekend of building campfires, pitching tents, and traveling the road less traveled. Like the aluminum RLT, the RLT Steel was intentionally built for the curious and spontaneous. Its starts with the 853 tubing which excels at absorbing and smoothening out road chatter, while maintaining a carbon-like stiffness and responsiveness. If you mainly stick to the pavement or fire roads you can use 700c wheels to run road or cross tires, or if you want something a little wider (up to 1.75") you can use a 29" wheelset thanks to the 142mm rear hub spacing. 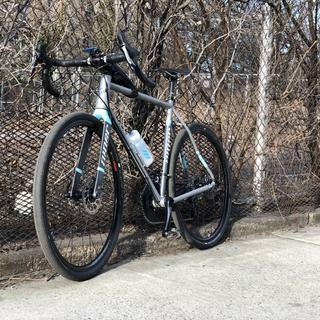 The slightly longer chainstays, slightly lower bottom bracket, and slacker head tube angle make this a real gravel grinder for the long haul. To make this a bike you can truly ride on and off road all day, the RLT 9 Steel features a gravel-tuned, custom painted Niner Carbon fork to eat up all those road and "not-road" vibrations. Connecting the dots between classic frame design and modern technology, the RLT 9 Steel is augmented with thru-axle technology and a tapered steel headtube, greatly improving the overall ride quality. The RLT 9 Steel features a PF30 bottom bracket shell allowing you to run it geared or single speed with Niner's BioCentric 30. Some of the clever, less-noticeable frame features include rear rack pannier braze-ons for when the adventure lasts longer than a few hours, and three sport-beer compatible water bottle mounts ensuring you have fuel in places that don't. The RLT 9 Steel is exactly what you'd think of when hearing that Niner made a 700c, steel drop bar bike: beautiful, versatile and ready to seek. I have a fendered Surly Stragger with racks for winter riding and trekking, but wanted a lighter bike for stripped down day tripping. This bike is perfect for that--plus can be fully tricked out with trekking assessories. Pros include SRAM components (I don't like how Shimano uses the brake levers as shifters), great brekes, flared handlebars, and the fact I got the 2018 drivetrain rather than the 2017 I thought was going to be on the bike. Cons are the stock tires which are so-so on gravel/dirt roads and a little harsher ride than the Stragger. Ride might be because of the carbon forks on the Niner versus steel on the Stragger. But release some air and it equals out. I love how lively the Niner feels and how fast it accelerates. The freewheel is a bit noisy, which is a sign of quality and great for letting pedestrians know you're coming up behind them, but I find it annoying in the woods. Overall though, I'm very satisfied with the bike for the discounted price I paid for it through Jensen. I love this bike! Picked it up because of it's advertised versatility. I've ridden it on the road, single track, and gravel paths so far and I'm very pleased with it overall. I have plans to do some longer gravel rides and some overnight tours, but I'm sure it will handle it well. It's such a comfortable ride. Road Less Traveled, until you take this bike on it! The RLT 9 Steel is the best bike I’ve ever owned. The steel frame is stiff yet super compliant, and takes the clang of the rough roads and gravel quite well. There are a ton of mounting points for fenders, racks, and any accessory you can think of for touring, commuting, bikepacking, or grocery shopping! The 3 Star SRAM Rival groupset shifts like a dream! I prefer SRAM shifting in a bike like this as it feels more simplified than Shimano. The only issue I have is the the gearing. 46/36 with 11-32 is a great middle ground for all-around riding, but doesn’t do any single type of riding the best. However, this type of bike is made for all around riding, so I don’t blame them putting this as a (great) starting point in which you can swap out components to your liking from there. Does this come setup as tubeless already? BEST ANSWER: Yes - I can confirm that the Niner RLT 9 steel (model year 2018) came set up tubeless. A pleasant surprise!